The networking architecture lays the foundation upon which all other layers of the Unified Communications System are deployed. Figure above shows the logical location of the networking layer in the overall Cisco Unified Communications System architecture. 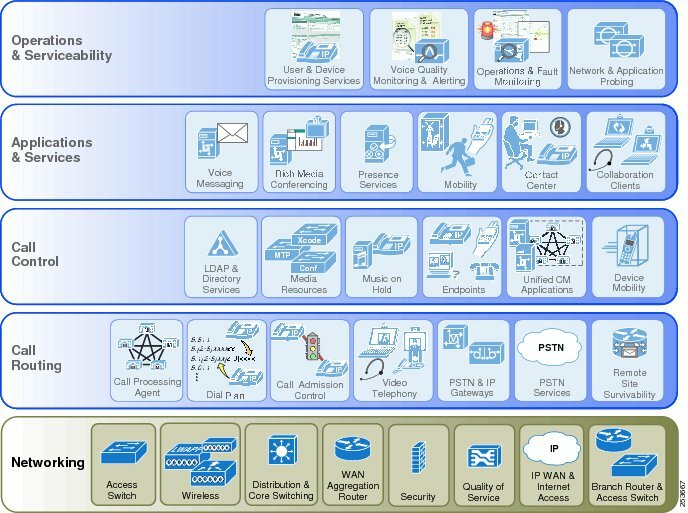 All other layers of the Unified Communications System architecture, including call routing, call control, applications and services, and operations and serviceability, rely heavily on the readiness of the network to support their services. The networking layer is the single most important aspect of a solid Unified Communications foundation in that it provides the quality of service needed to ensure applications have uncompromised access to network services. The networking layer also ensures the correct deployment of servers and the proper bandwidth for endpoints and services to communicate effectively and securely.